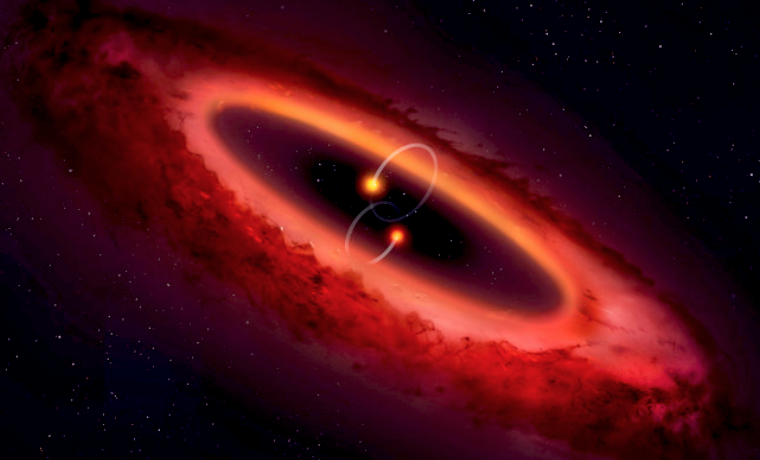 Quadruple star system — Astronomers using the ALMA telescope have discovered an oddly tilted planet-forming disk within a double binary star system, a configuration that up until this point only existed in theory. The star system is 146 light-years from Earth, and is called HD 98800. New research published in Nature Astronomy reveals this system features an exceptionally strange protoplanetary disk. ~ Yes, but everything about space is strange to me. Wet Footprint Effect shows rain on Titan — Scientists have found evidence of seasons on the surface of Saturn’s moon Titan. Cassini’s observations of the long-overdue rain finally came in on June 7, 2016, signalling the start of Titan’s north polar summer. ~ And so ends the moon drought. China posts Moon dark-side panorama — The Moon’s far side near its southern pole is a dead, dim place littered with pits and rocks, as the first panoramic image taken by China’s Change’ 4 lander confirms. ~ That lander sure uses a lot of tin foil! Maybe Musk is missing a trick, here? Bioengineering increases rice yield by 27% — A new bioengineering approach for boosting photosynthesis in rice plants could increase grain yield by up to 27%, according to a study in Molecular Plant. The approach, called GOC bypass, enriches plant cells with CO2 that would otherwise be lost through a metabolic process called photorespiration. ~ Then won’t you need more water for it? Ah, that’s why we’re increasing the water yield from the frozen north and south! “The world will just melt and the world will become one vast atomic explosion” — Some of the most interesting predictions for the future don’t come from expert futurists or well-financed think tanks, they come from average kids. Gizmodo has a video from the 1960s that features kids talking about their own vision for tomorrow. And it’s depressing as hell. ~ Gosh, I do hate it when the world melts. Arborists are bringing the Dinosaur of Trees back to life — Arborists are cloning saplings from the stumps of the world’s largest, strongest, and longest-lived trees, felled for timber more than a century ago, to create redwood “super groves” to help fight climate change. Already, super saplings from the project are thriving in groves in Canada, England, Wales, France, New Zealand, and Australia – not places where coastal redwoods grow naturally. These trees are champions when it comes to eco-technology; they filter air, soil, and water and are capable of removing record amounts of carbon dioxide emissions, the leading cause of accelerating climate change, from the atmosphere. ~ Can we wait long enough? Longest aircraft, the Airlander 10, gets go-ahead — The world’s longest aircraft is set to go into full production with the model designed to take its first passengers. Bedford firm Hybrid Air Vehicles (HAV) has been given Production Organisation Approval from the Civil Aviation Authority (CAA). 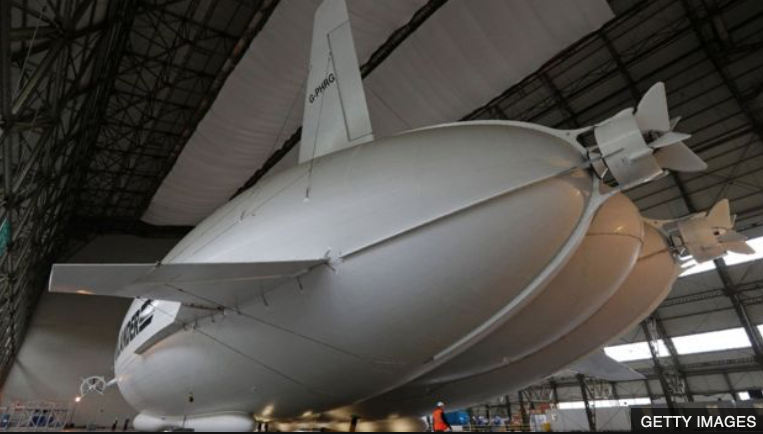 The prototype £32m Airlander 10, a combined plane and airship, has been formally retired following successful final testing. Researchers from the University of Houston have reported a new theory in physics called stress localisation which they used to create a durable silicone polymer coating capable of repelling ice from any surface. Fat to fool cancer cells — Researchers from the University of Basel in Switzerland have discovered they can prevent the formation of metastases by fooling breast cancer cells into fat cells. The proof-of-concept study was published in the journal Cancer Cell. ~ Now that’s ‘good fat’! Movement mitigates Alzheimers — Moving more might help to keep people’s brains sharp as they age – even in the face of dementia. Scientists have found older adults fared better when it came to cognitive tasks if they clocked up higher levels of daily activity on a wrist-based tracker – something the researchers said picked up everything from exercising to mundane tasks like chopping onions. ~ I’ve always thought just moving more is better all round for everything, over fad diets and some medications.